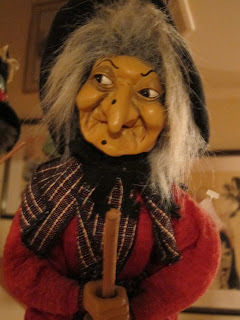 I promised a while back that I would put some photos of my witch collection on this blog. For some reason I have a husband who calls me the Witch of the Reier Forest instead of Angel or Darling. He buys me witches when we visit different countries and they now thrive hanging from a beam by the stairs by the kitchen/dining room. Some are on the mantle right next to the stairs. I am intrigued by witches. Even more so I am fascinated by the historical background of the witch hunt and why mass suggestion caused the persecution and accusation of innocent women--and men. 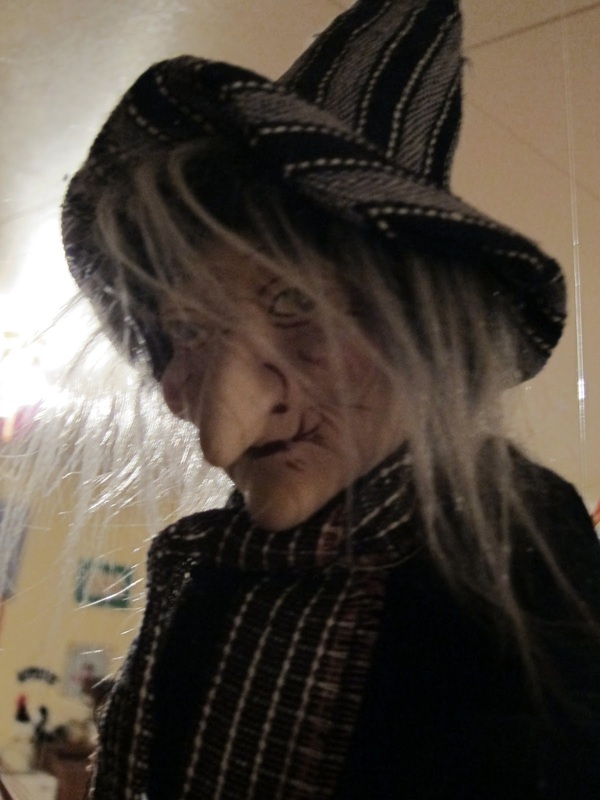 Generally, a witch is a woman claiming to possess magical powers. She is popularly believed to practice sorcery. She may be a Wiccan. She may just be a hag. My interest in witches has brought me speaking engagements, articles, and much more. Keep reading my blog for further exciting announcements on this subject. At the Duck and Cherry there are wooden plaques with sayings also. One says, "Witch parking only, all others will be toad." And the weather wane on top of the garage is a witch flying on her broom. I admit it, a magic wand would be great to have. A swoosh with the wand and my house would be cleaned in a second. A broom would certainly bring me places in no time. See earlier blog entries: A Petition for Flying Brooms and The Broom Closet. They all have names from their original country. Some of the names are from real people. 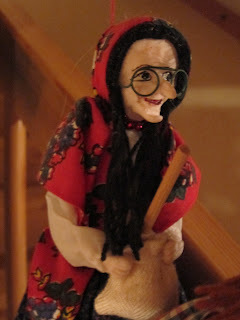 For instance, the Austrian witch, Klothilde Pittner, is named for a sweet elderly woman I knew when I lived in Wilhering, outside Linz. She had an abundant knowledge of herbs and their uses. I could call her up and ask her what to give my children and she always had the right answer. Besides, her name was really great. 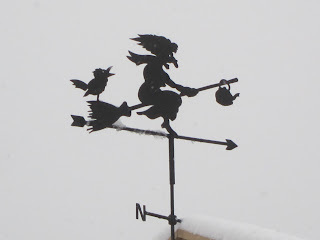 Photos today: my weather wane, Pelagia, Tallulah,and Danuta.